Early on in “Deathtrap,” a man seeking help moving a body shouts, “What’s done is done, I don’t see the point in getting a hernia!” Immediately we’re laughing at a murder, lifting our tension as we settle into Ira Levin’s macabre humor. 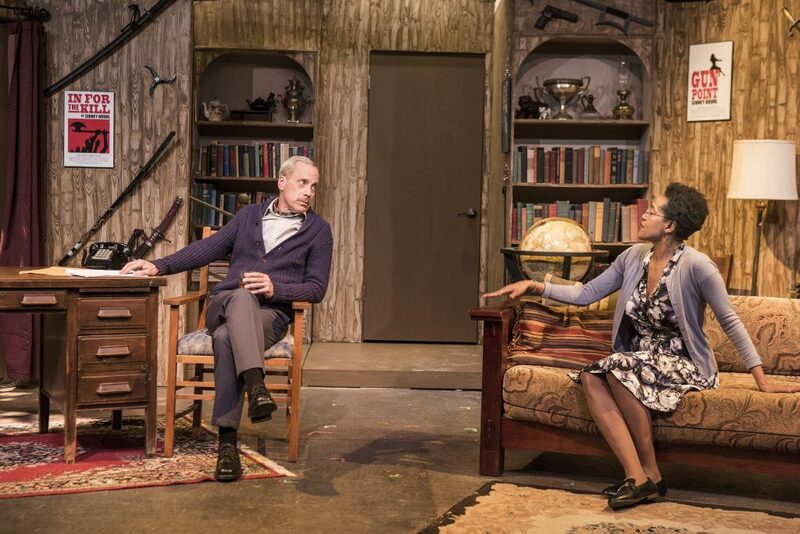 Theatre Rhinoceros’ “Deathtrap,” a perpetually popular 1978 murder thriller, feels fresh with the brilliant directing team of Jerry Metzker and John Fisher, and a superb cast. Fisher delivers a stunning master class in physical comedy, eliciting laughter as he stumbles over bodies. Add the terrific timing by Desiree Rogers and you have the perfect comic thriller couple. Fresh off a series of flops, playwright Sydney Bruhl (animated John Fisher), and his crafty wife Myra (delightful Desiree M. Rogers) receive a draft of a play titled “Deathtrap.” Sent by former student Clifford Anderson (eager Jake Soss), Sydney pronounces it brilliant; he is quick to tout its financial promise to his wife. Designer Gilbert Johnson’s eye-catching set makes us comfy in Bruhl’s seductive wood-paneled study. Threatening weapons hang on the walls: guns, swords, archaic torture devices. Along with Chekhov’s Gun, we find a mace and a crossbow, so we eagerly await some gruesome murder. Naturally, Sydney jokes to Myra, they ought to invite Clifford to the house, kill him, and steal his script. Joking turns to planning, planning turns back to joking, and we’re unsure exactly where the couple stands on their grim scheme. What follows is a melodramatic series of shocking murders, sudden twists, and uproarious laughs. 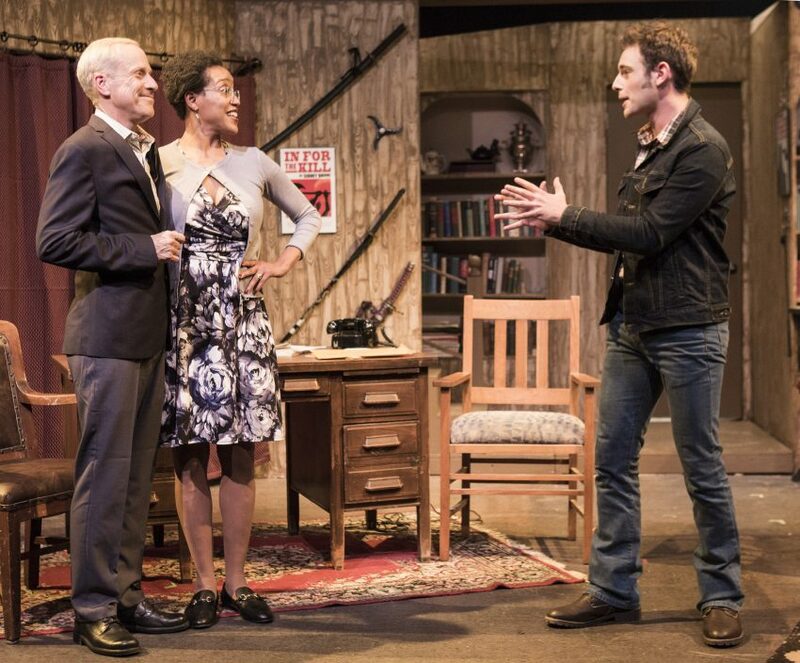 Ira Levin’s self-aware deconstruction of the thriller sets the play apart. Experienced Sydney and student Clifford are both steeped in the tricks and techniques of the genre. Each writer thinks he has the upper hand when it comes to predicting, or subverting, the other’s schemes. In a hilarious showdown at gunpoint, Levin lampoons “last-minute reversals” as Clifford and Sydney out-out-maneuver each other. We roll our eyes and laugh along, as our memories of Agatha Christie mock us. Levin trots out a mysterious psychic and a shady lawyer, too. As the eccentric psychic Helga Ten Dorp, marvelous Anne Hallinan startles us, screaming at dark visions. And grand Randy Solomon, as Sydney’s lawyer Porter Milgrim suspects everyone. 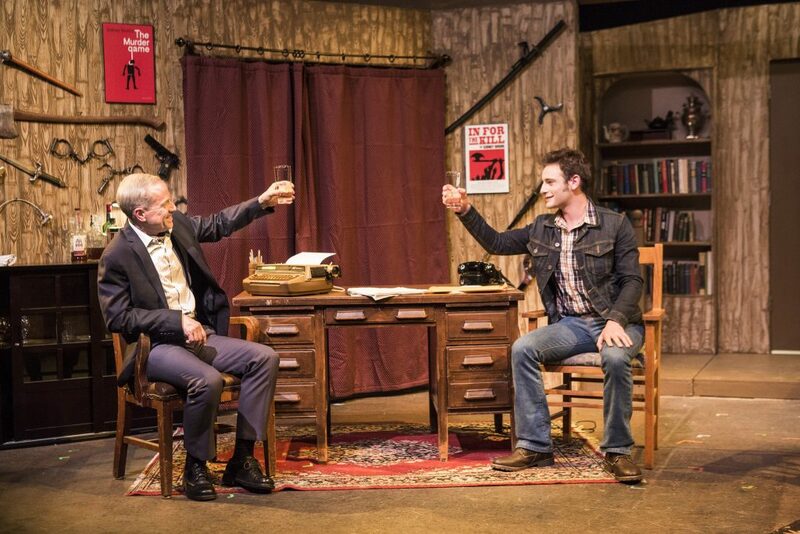 “Deathtrap” comments on greed and narcissism. 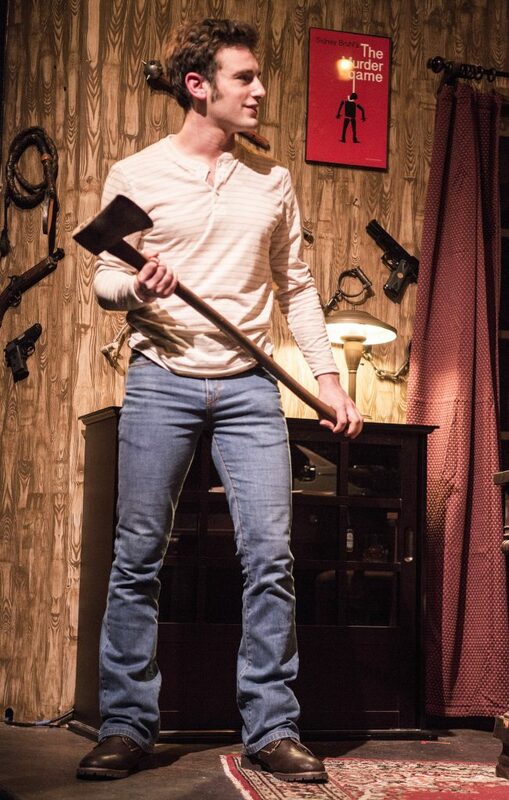 Like certain public figures, a playwright willing to murder for a million bucks is not so far-fetched. Co-directors Metzker and Fisher add a campy flair to “Deathtrap” that does wonders for the show. Familiar sound cues like the infamous “dun dun duuuun” and thunderclaps with impeccable dramatic timing highlight the ghoulishness. 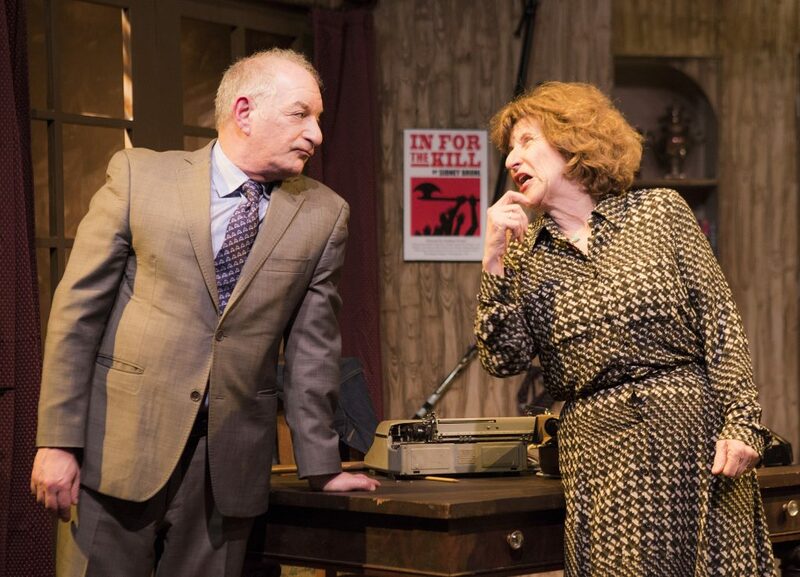 Rhino’s “Deathtrap” uses camp and comedy wonderfully to teach an old genre new tricks. Cast: John Fisher, Desiree M. Rogers, Jake Soss, Anne Hallinan, and Randy Solomon.